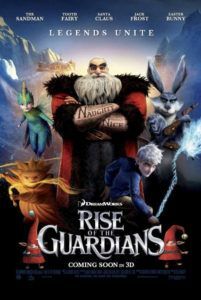 A league of extraordinary mythical characters assembles in DreamWorks Animation’s Rise of the Guardians, a busy computer-animated adventure based on author and illustrator William Joyce’s children’s book series. The screenplay by David Lindsay-Abaire (Inkheart) is somewhere between the Justice League or Avengers, where seasonal heroes like Santa Claus and the Easter Bunny join forces against a common evil, saving the holiday shopping season forevermore. More attuned for older kids rather than the very young, it’s an action-packed tale populated by fabled characters who have insecurities about children believing in them. 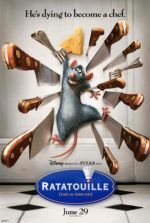 Although beautifully animated and diverting enough, the derivative story structure lacks inspiration and relies too heavily on how its characters differentiate from their Hallmark iconography and not enough on innovative storytelling. Our entry point into this world is Jack Frost (voice of Chris Pine), a boyish teen endowed with snow and ice powers by The Man in the Moon some 300 years ago. Ever since, this free spirit flies about causing snow days and ice storms without a care in the world. An unlikely and reluctant hero, he annoyingly dons a hoodie and slacker haircut so modern youngsters can relate. When the world’s children are threatened by the Boogeyman, known as Pitch (Jude Law, delightfully evil), Jack is asked to join the Guardians and fight. The team is led by Santa (an excellent Alec Baldwin), whose Russian accent, swords, “Naughty” and “Nice” tattoos, and workshop populated by zippy elves and toy-making yetis makes for a humorous twist. Also joining are a boomerang-throwing, Australian-accented Easter Bunny (Hugh Jackman), a spritely Tooth Fairy (Isla Fisher) who looks suspiciously like Talkatoo Cockatoo from Zoobilee Zoo, and a round mute Sandman who spins golden dust. Jack resents the lot, since he goes unrecognized by children while they are beloved for their offerings; each have a special day or remain popular enough to earn a place in the consciousness of young ones, and he goes overlooked. Also unnoticed and forgotten is Pitch, who uses this association with Jack to tempt him over to the ‘dark side’. Of course, Jack eventually discovers why he has what it takes to be a hero, resists Pitch, and bands together with the other holiday heroes to stop Pitch’s master plan—to make the children of the world forget about the Guardians, thus removing their powers. A combination of Harry Potter’s Voldemort, Hades from Disney’s Hercules, and Tom Hiddleston’s Loki from The Avengers, Pitch’s motivations and appearance are gallingly clichéd, as he appears in wisps of granulated black smoke and uses his convincing trickery to deceive his opponents. Director Peter Ramsey, a storyboard artist for Minority Report and A.I. Artificial Intelligence, makes his feature debut here and commands the film’s visuals, even if he cannot make up for the underwhelming story. Characters and settings have real depth and texture, perhaps due to cinematographer Roger Deakins serving as a visual consultant, while the action sequences unfold with rollercoaster energy seemingly determined to incite a feeling of dizziness. 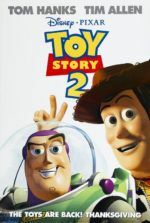 But the impressive animation is undone by the story and characters’ unoriginality. Consider Santa’s hapless elves, who are another in a number of gibberish talking sidekicks present only for comic relief; from the Pizza Planet aliens in Toy Story to the minions in Despicable Me, they’re all the same disposable fodder. However, comic relief does take a back seat to the adventure plot; comic moments are had (such as when the Easter Bunny is transformed from a warrior into a cuddly rabbit), yet they’re never prevalent, which forces one’s involvement in the otherwise stirring events. The voice cast deserves top marks all around, particularly Baldwin and Law; Pine’s heroic voice does its job well enough too, and Jackman is clearly comfortable speaking his own Aussie accent. But Rise of the Guardians has an intriguing premise that makes you wish the writers had spent more time developing their conflict and distinguishing their villain from others like him. 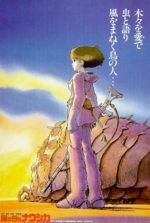 There’s a fine message at the film’s center about allowing children to believe in such fantastical heroes because, as it were, it’s every child’s prerogative to believe in such superstitions. In this way, it makes sense that Guillermo del Toro (Pan’s Labyrinth) executive produced the film. It all reminds one of last year’s similarly themed Arthur Christmas, wherein Santa’s youngest son must protect one boy’s faith in the Christmas spirit. Alas, this film has none of the same magic or inspired qualities outside of character design. Some children will no doubt enjoy the comic book styled action setup, but it’s a far cry from unique, and has “marketing ploy” and “franchise starter” written all over it.